Considering the importance of a cobbler and the cobbler’s shop to a community, it is not surprising that in the early 1700’s an artisan and craftsman would choose this as the subject and the scene he would construct in a bottle. Perhaps the maker was a cobbler himself, or maybe a close friend or a customer made the bottle to give to a cobbler. We will not ever know the true facts and history of how and why this bottle came to be, but what we are left with is a marvelous and wonderful bottle from history with a diorama that helps us visualize and re-live a moment from that shop. Like a great painting, we are drawn into the scene. We can imagine ourselves in that workshop hearing the laughter and celebration as glasses are raised in a toast. As suggested by renowned expert Peter Huber, perhaps they are celebrating one of them passing an examination for his Master Craftsman Diploma, or maybe they are celebrating the passing of ownership of the business to another. Whatever the reason for celebration, we can feel ourselves sharing in their merrymaking and revelry. In a mere 4 inch by 4 inch by 6 ½ inch slightly tinted green bottle, the artist has captured the scene, the emotions of an important event, the people, the tools, and the shoes and boots, with wood, cloth, paper, wire, cotton and paint . The skill of this artist is evident at first glance. 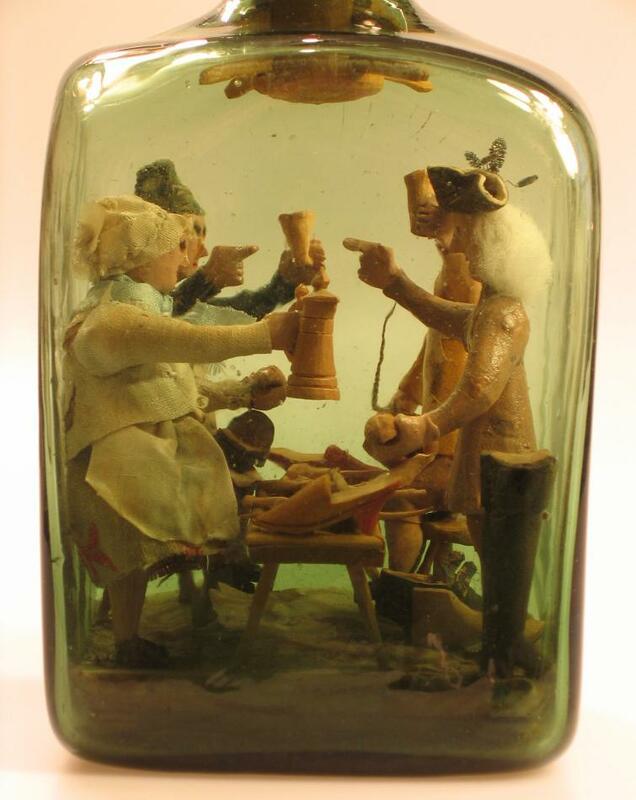 He has carved and placed the figures and planned the scene so that he could gain full advantage of the bottle’s size. In so doing, he has achieved one of the goals of folk art, whimsy, and ship in bottle makers over time and that is to make the scene fill the bottle as much as possible, making it look even more impossible to go into the bottle. The “Cobbler’s Workshop” is the name commonly given to this bottle. 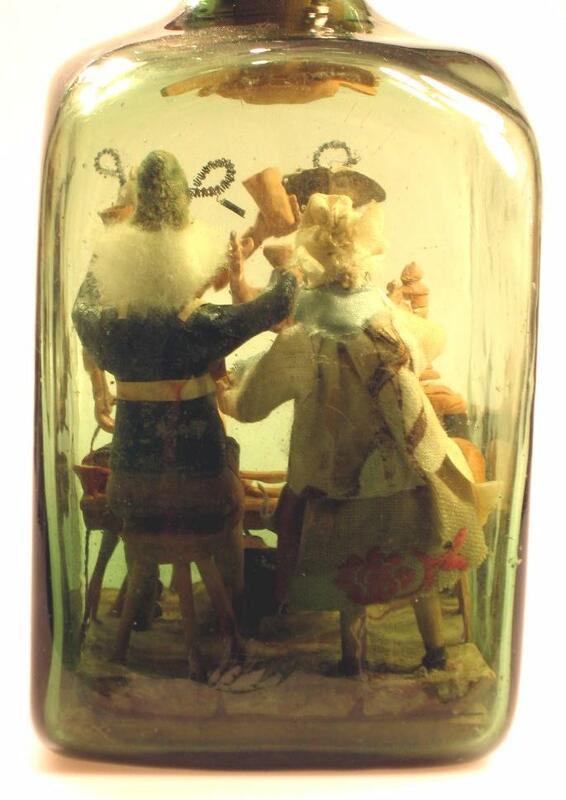 The bottle contains a wonderful diorama of four people standing and sitting around a cobbler's bench holding wine and bread as if in celebration. There are three men and one woman all carved from wood. The clothing is from the early 1700's and is carved in wood except for the woman's clothing, the aprons on two of the men, and the hats each figure is wearing, all of which are made from cloth. The woman is wearing a gray skirt with red embroidery on the back that may be initials. The first letter is appears to be a "G" but it is difficult to read. The second looks like a "K." She is wearing a long sleeved white shirt and her bonnet is made from the same material. There is a blue scarf tied around her neck. She has black shoes and gray socks. In one of her outstretched arms is a large stein and in her other hand is a small loaf of bread. She is portrayed standing. Next to the woman is a man seated on a three-legged wooden stool. The man has a blue long sleeved shirt and a full apron. He is wearing a blue hat with a fine coiled wire extending from the side of the hat. He has long white cotton or wool hair and black shoes. His arms are raised, showing an open hand with a finger pointing and the other hand holding a wooden goblet. In front of the woman and man is a long work bench. Across the work bench are two more people. There is a man standing with one of his arms down near his side and holding a loaf of bread. His other hand is up high with a finger extended as if pointing. He is wearing a leather-like tan colored jacket. He has long white hair and is wearing a three-cornered hat with a fine coiled wire extending from the back. Next to this man is another man sitting on a three-legged wooden stool. He is also dressed in a tan colored jacket and is wearing an apron. This man also has long white hair and is wearing a cloth hat with fine coiled wire extending from the top. He has one arm raised and is holding a wooden goblet. His other arm is in a down position and is holding a long length of thread or rope. All of the figures as carved with very detailed facial features. The work bench has 4 wooden legs and is full of shoemaking tools and three shoes in the process of being made or perhaps repaired. There are several awls and knives on the bench. There is a large black boot in the corner of the bottle next to the man in the three-cornered hat. There is another shoe between this man and the man seated beside him. The men and the workbench are on a wooden planked floor. The bottle is sealed with a wooden stopper that is slotted inside the bottle so that two cross arms can go through forming a "plus sign" that keeps the top from being removed. Outside the bottle, the stopper is carved in a cone shape and is painted or stained in a dark leather appearance. There are two holes on the side of the top that were probably where string was used to pull the trick cross arms into place in the bottle stopper. 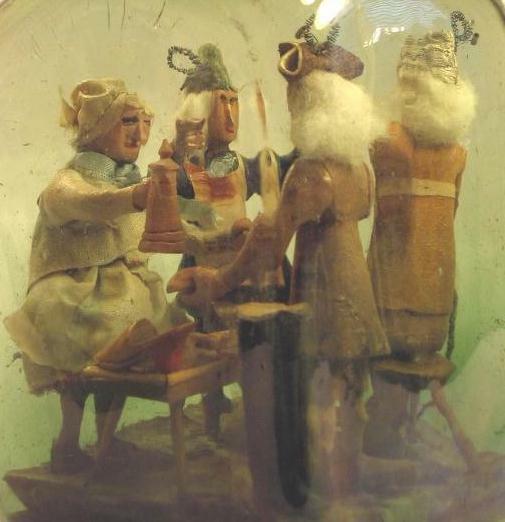 This is not only a very wonderful and skilled diorama built in a bottle, but it is also an important bottle because it is very likely among the earliest scenes ever built in a bottle. 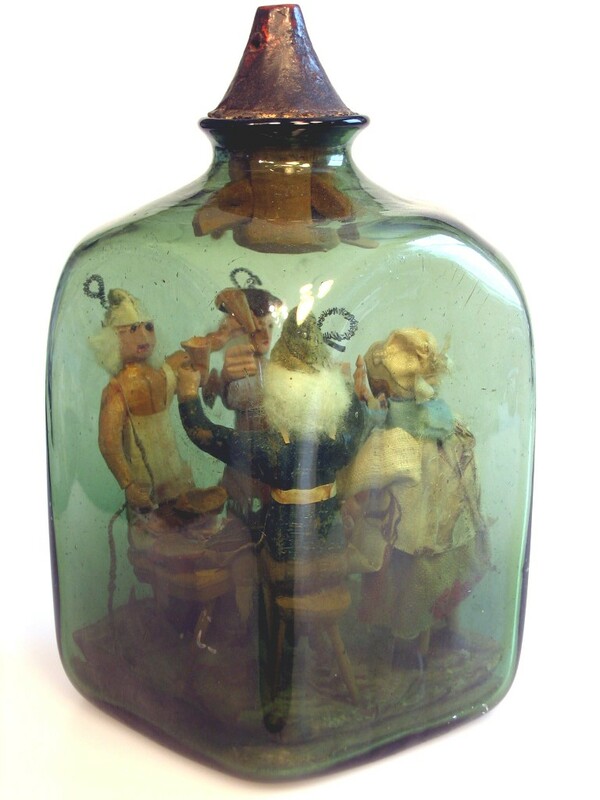 Peter Huber, a world renowned authority and collector of what are usually called “patience bottles,” tells us that among the most important types of patience bottles are the ship in bottle, religious and crucifixion scenes, mining bottles, and other representations of other occupations. 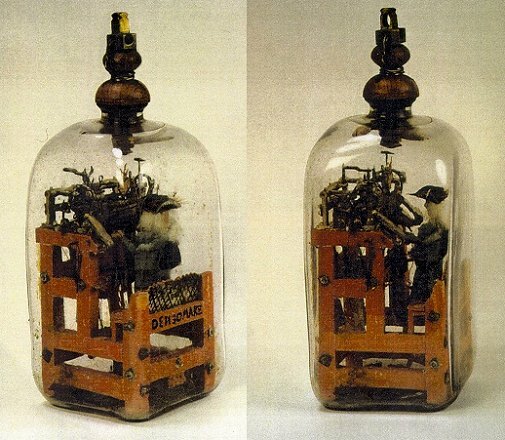 The earliest references of items built in bottles date from 1679 and then 1694. 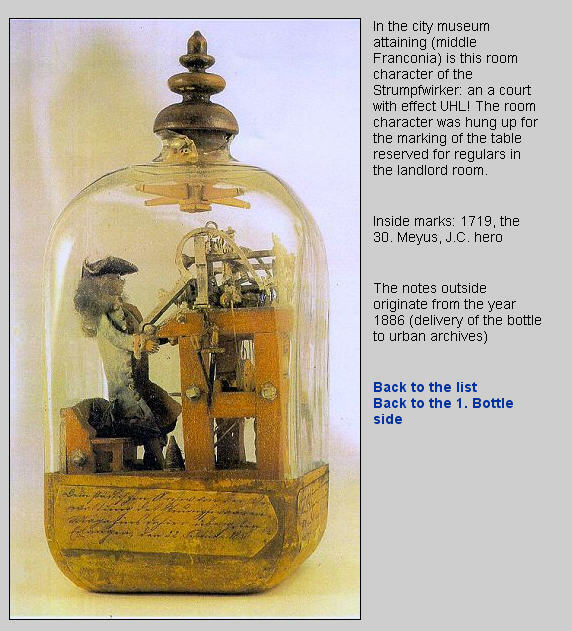 The earliest known bottles that still exist are now in museums and date from 1719. 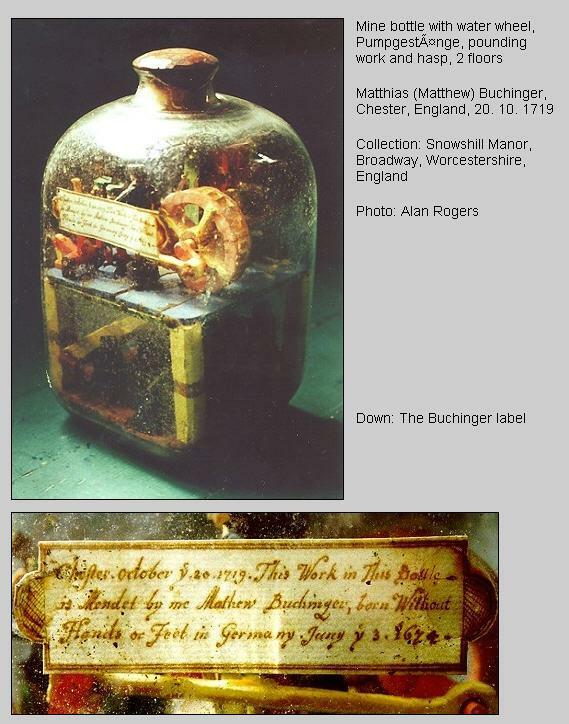 The bottle on the left is an example made in 1719 by Matthias Buchinger who was born without hands or feet; it was found in Snowshill Manor, England. Two bottles from early history are of particular interest. One bottle, by J. C. Hero (also spelled as Held in some publications), was made in 1719. A second bottle, also by Hero, was made in 1736. When comparing the bottles of Hero with the Cobbler’s Workshop, several common characteristics of the bottles can be noted. First, the very shape and style of the bottles are very similar in size and shape and appear be from the same period. 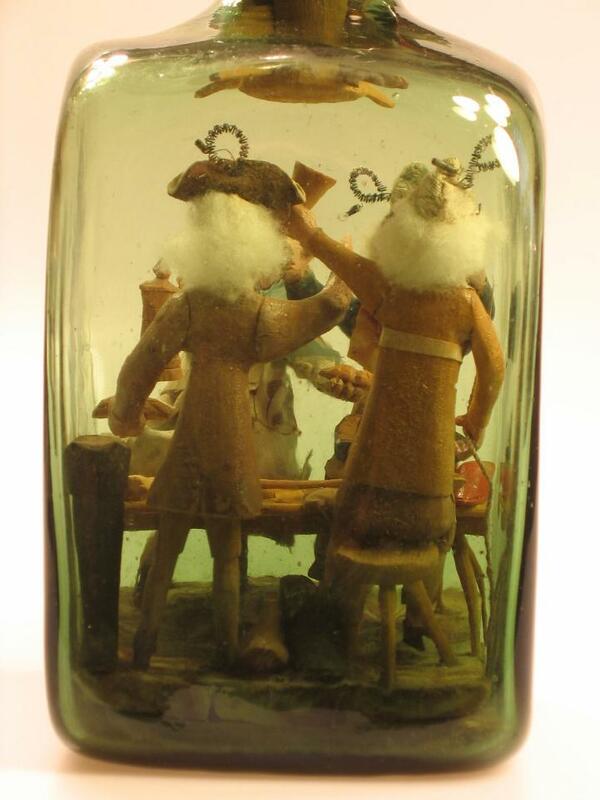 Secondly, the figures in the “Cobbler’s Workshop,” and one in particular, are made in a very similar manner to the figures in the bottles J.C. Hero. The figure’s face, 3-cornered hat, nearly same hair style and material used for the hair, the elongated torso, and more, are some of the more striking similarities between the bottles. 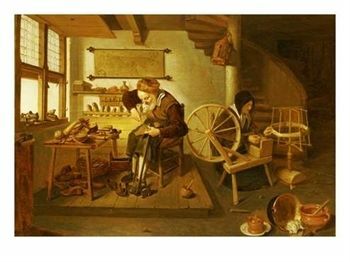 Additionally, Hero and the Artist of the “Cobbler’s Workshop” both used real cloth for clothing. Third, the bottles are sealed with same double cross-piece locking mechanism that goes through the wooden stopper inside the bottle forming an “+” and making the bottles “tamper-proof." The wooden stoppers used in the bottles made by Hero, however, are more ornate than the one in the “Cobbler’s Workshop.” Fourth, all the bottles contain scenes rather that just a single object, and the scenes are very much ones that you would expect to find in the period of the 1700’s. This comparison of the “Cobbler’s Workshop” with the bottles of J.C. Hero is not intended to make a case that the “Cobbler’s Workshop” was made by J. C. Hero. Rather, this comparison is to help us pinpoint the timeframe in which the bottle was made and perhaps the country of origin. This evaluation of the bottle, the period clothing and scene, and the use of similar techniques does give strong evidence that this bottle is a contemporary of those of J.C. Hero and probably dates from 1720 – 1750. It is highly unlikely that this bottle was made by J.C. Hero, but no definitive evidence has surfaced to rule that out at this point. Far more investigation and research will be needed to learn more about this bottle. It may be likely that we will never know the background of this bottle. Meanwhile, it should be remembered and recognized that most bottles of this type are not signed or dated. Even in the absence of this provenance, experts can still infer the period and possible or probable artist of these bottles through close examination and comparison. It is difficult to find experts in this field to help with research and evaluation. While there are many individuals around the world crafting ships in bottles, and fewer who build other objects and scenes in bottles, only a handful can serve as authorities on the craft from a historical and, for that matter, contempory standpoint. Those who have gained the skill and knowledge to offer authoritative opinions are themselves hampered by the fact that this is a craft that produces "one of a kind" works of art so that direct comparisons can rarely be made. In addition, many of the outstanding examples are already in museums or rarely come up for sale. When they do sell it is often a private sale or an unadvertised sale, making it difficult to learn that the sale even took place, much less the details of the transaction. There is very little publicized information other than some on-line auctions and eBay. Additionally, there are very few books on the subject and therefore, experts must rely on years of study and research, shared information with others in the field, and sometimes just relying on gut feelings backed with reasonable knowledge to date bottles, makers, and the market or insured value. 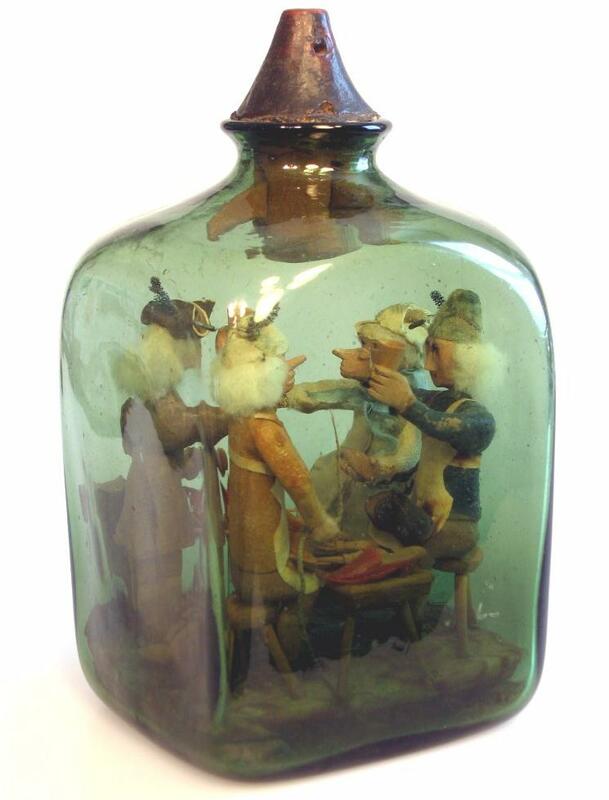 As the owner and developer of folkfolkartinbottles.com, and an on-going and avid researcher of the history, artists, bottles, and the craft, I feel qualified to offer an opinion and assessment of the "Cobbler's Workshop" and I do believe it is an early 1700's bottle and among the earliest scenes in a bottle that has been uncovered. I have heard from other reputable experts to assist in descovering the history and facts about this bottle. Some of their comments follow. Peter Huber is a world renowned bottle expert from Germany. He is an author, collector, and a restorer of patience bottles. He has web pages at http://www.mineral.at/, and his new page at http://www.kunstkammer.at/. Peter has written that this bottle is from the 18th century and likely around the 1730’s. He does not believe that this bottle was made by J. C. Hero, but does believe that it is a wonderful work from that period. Susan D. Jones, author of “Genius in a Bottle, the Art and Magic of Bottle Whimsys,” and the owner of www.sdjones.net, is a collector, restorer, and well-known American authority. She could not offer any information about who may have made this bottle, but she also believes that the bottle is an early 1700’s bottle. Chris Wood is an outstanding researcher and an avid student of this art form. He is a crafter of bottled whimsys and is a collector and restorer. Chris, a well known American authority of bottled whimsys, also dates this bottle from the period of the early 1700’s. If you have any information about this bottle, or know anyone you feel may be able to provide any assistance or can give additional information, please contact me.